3000 dogs and cats have become ill, and nearly 600 have died, in the past several years, because of jerky pet treats imported from China, and not just chicken jerky. And they keep on dying. And we keep on importing it. Things have gotten so bad that the FDA is now reaching out to the public for help in figuring out why food products imported from China seem to keep killing our pets. At the same time, what does the FDA do? Change the rules so that humans get more of their food products from China, particularly chicken, because when has chicken from China ever made anyone sick? Oh that’s right, a lot (keep reading). In the new warnings and public appeals, the FDA says that since 2007 they’ve received around 3,000 reports of illnesses of dogs and cats associated with jerky products, mostly from China. Of those, 580 died, and most were dogs. We also remind pet owners that treats are not needed for a balanced diet. That’s a polite government-y way of saying ixnay on the eats-tray. Watch your pet closely. Signs that may occur within hours to days of feeding the products are decreased appetite, decreased activity, vomiting, diarrhea (sometimes with blood or mucus), increased water consumption and/or increased urination. Severe cases are diagnosed with pancreatitis, gastrointestinal bleeding, and kidney failure or the resemblance of a rare kidney related illness called Fanconi syndrome. The majority of complaints involve chicken jerky (treats, tenders, and strips), but others include duck, sweet potato, and treats where chicken or duck jerky is wrapped around dried fruits, sweet potatoes, or yams. The illnesses have been linked to many brands of jerky treats. The one common factor the cases share is consumption of a chicken or duck jerky treat or jerky-wrapped treat, mostly imported from China. Pet owners should be aware that manufacturers do not need to list the country of origin for each ingredient used in their products, so packages that do not state on the label that they are made in another country may still contain ingredients sourced from China or other countries that export to the U.S.
Well maybe it’s time that law changed. And maybe it’s time that US manufacturers of pet products started listing, definitively, where their products come from. Oh, but the the fun has only begun. Guess who is going to be preparing chicken for import (or re-importation) to America for human consumption? Yep, you guessed it, China. Why are the jerky treats made in China? China is a country where dark meat is more popular due to its inherent fat and flavor. DOGSWELL believes it is less wasteful to obtain our white meat in China where it is abundant, rather than sourcing it domestically, where white meat is less available and held at a premium. Not only do we care about your pet’s health by sourcing only the healthiest meat available, we also practice sustainability by reducing as much waste as possible. Sasha is in full preparation for Halloween. China is now processing American chickens for reimportation back to the US, and again, no one is planning on telling you if your chicken has been processed in China. Did you know that a few years back nearly 3 million Americans ate chickens that were fed poisonous Chinese pet food? But the fun hardly stops there. Consumers have been plagued with Chinese poisonous toothpaste, dangerous tires that leave out a special safety feature, tainted baby milk, tainted pork, toxic rice, kidney-damaging cookies, cake and candies, bird-flu infected chicken, dying pigs, and toxic fish. So, now, when you eat something processed in China, you don’t need to simply worry about whether the product was made by Christian slave labor, you also have to worry about, you know, whether it’s going to kill you. Actually, you won’t worry about it at all since the processed-in-China aspect of the chicken won’t have to be disclosed. Because what could possibly go wrong? And come on, who doesn’t love an exploding watermelon? I have noticed my dog was spiting up the last few days and going to the bathroom allot, so I checked his treats which are Happy Hips chicken and Breather’s by Dogwell, we feed him locally grown organic chicken gizzards, livers for his regular food, never anything from a store . So, we did not feed the dog any snacks for several days , and he is much better today….I would stay away from anything made in China, period. Read it again, Costco conducted their own independent testing on product they sell. Absolutely not. There must be an independent testing regime where any outside influence or pressure is treated exactly like what it is, corruption. Sure, it could be a private company, just as long as that company is an independent organization. How about private testing. Spoke to the VP of product safety at Costco. They ran tests on pet treats they sell, some tests are even more stringent than human food testing. LOL! Few regulations, few tests, and no FDA labs to conduct tests, they are all outsourced! So no, the FDA can’t pinpoint anything anymore because they don’t have the resources! Meanwhile, they do have the resources to go after people selling raw milk. Your best bet these days is to find a country which DOES have proper consumer protection laws and an apparatus to make sure that laws and regulations are followed and import your food from there. o hai there happy hips employee! please be sure to self-identify prior to posting. I have been giving Happy Hips to my dogs for over a year and have no problems. They love them. I have two toy dogs and give them one strip per day. They go crazy when it’s time to eat them, I think they are addicted. I have increased their serving to two stripes: one Breathies for teeth along with the the usual one for bones sttength. The only seem to get a little thirsty after eating them and get a little drink of water. They are fine. oh honey, i’m so sorry. zoe was indeed a beautiful companion and words just fail me right now. I never trusted that fake jerky it looked wrong. I don’t get why people don’t buy the real thing for treats. Cost factor? My rule with nutrition for my dog is if it didn’t look good for me it didn’t get bought. Dogs love jerky and bacon treats and neither costs so much that the real product can’t be used it’s not the quantity of the treat it’s the quality. In the end I found it less expensive to use stew cut beef and hamburger to supplement the dog food and I knew what my dog was getting. A pound of burger or stew beef with rice mixed in would last a few days and was actually less expensive than canned food and didn’t leave me concerned about what went into that canned meat by products. I was happy to see the Temptations® treats I feed my cats are made in Canada. Just FYI. We shouldn’t have to do extensive research on pet food products just to determine what’s safe to feed our pets, but it seems to have come to that. We should be able to know exactly where all our food products are manufactured, and exactly what products went into it. Even then, cheap labor, no regulations, and weakened American labeling laws, mean countless loopholes you can sail a plane full of chickens with avian flu and tubs of mysterious plastics used as ingredients through. How many more pets have to suffer and die because of these weakened and/or non-existent labeling laws? And how many people are going to have to start suffering and dying for the same reasons? I new all about this stuff MONTHS ago because I get email alerts from Dog Food Advisor. These folks don’t push any brand above another, they just go by the ingredients and they explain why they matter. They also send out email alerts when there’s any kind of a recall. I won’t give a link cause you’ll just think this is spam. Google DogFoodAdvisor and sign up for the alerts. It’s worth it if you love your dog. Also there’s the uncomfortable fact that when a number of brands were removed from the market in January 2013, reports of illness dropped sharply. I suppose that was entirely coincidence? Everyone must have stopped overfeeding their dogs salty treats at just the same time, eh? Anyway, given China’s absolutely dreadful record when it comes to substandard and contaminated foodstuffs and other products, I really don’t think there’s anything extraordinary about suspecting China’s wretched industrial practices yet again. After the ’07 scare I tried to find a brand that wasn’t made in China and couldn’t find even one. Eventually I was able to find a weird “natural” one that always remained soft, and my dog hated them. Now? I take breasts that I get on sale for about $2 – $2.50 a pound, put them in the freezer until just frozen, then slice them very thinly. Next, I either put them on a sheet of tin foil on a pan in the oven at about 175F overnight or a dehydrator. Cheaper, fresher and safer than the Chinese ones. Otherwise, I just give her beef soup bones from a local ethnic market, very inexpensive, and I keep in the freezer for her. It is time for all of us to stand up against corporate food practices for ourselves as well as our pets, and if you live in WA you actually have a chance to be heard with the upcoming vote on GMO labeling. Please do so. While bloat is dangerous and can be deadly, it does not cause kidney failure, pancreatitis, and many other things that have been reported from the feeding of foods and treats suspected to be toxic. If it was simply overfeeding of treats, the problem would have been dismissed as pet owner error pretty quickly. The FDA issued the warning because they’re scared that they can’t find an immediate causation. With politicians believing that food safety isn’t really all that important, and limiting their funding and manpower, they’re required to reach out to the public get help to do their job. And the reason why China is easy to blame is because they have been to blame multiple times in the past. Trick question, right? Answer is obviously……eew, yuck! John, I’m sure it’s emotionally satisfying to blame China, but what are the facts? FDA can’t pin point any contamination. Google “canine bloat salty” and educate yourselves on why there are feeding instruction and warning about overfeeding on the packages. Pet treats are salty and not meant to replace proper meal. Overfeeding salty treats will cause your dog to drink too much water which can lead to canine blaot. Have you read this article: http://www.opednews.com/articles/What-s-REALLY-in-Chicken-P-by-Martha-Rosenberg-Arsenic_Birds_Chickens_Chickens-131022-71.html ? Recalls have happened so often and with so many companies over the last few years, all pet owners would find it in their best interest to set up a Google Alert, or something like that, for various keywords involved with pet food recalls. Maybe even with the brand names they use most often. What is truly sad is that because of all the dog photos on this thread we are getting pop-up ads for some of the dog treat brands covered by the recall! Beneful, made by Nestle Purina, has always been on the low end of pet foods. It’s barely a step beyond basic Dog Chow, unless you count the extensive marketing campaign. There were many claims about it being especially toxic a few years ago, but none of them were substantiated. No recall was issued and the FDA was never involved. Not to say there wasn’t anything to the claims, but generally something more specific comes up if animals are being sickened and dying from a particular brand. If you want an easy way to know which brands not to buy, walk through Wal-Mart’s pet food aisle. :) Of course, buying a specialty food for their pet is not something everyone can afford (or wants to afford) to do. Oh Monoceros, the pain of that loss is so palpable. Zoe was so beautiful. I understand the anger and the fury of failed regulations and lax China products that are allowed to poison our pets. Further, you are right—especially about Costco, recently there was an outbreak of toxic chicken from their rotisserie products—Foster Farms chicken and they are still selling them. As for details….your command of scientific information is greatly appreciated here. Same here. We cook Bodhi Dog’s food—mostly beef and fresh vegi’s and use a hypoallergenic kibble that the Vet has made for her clinic. Indeed, with millions of poor Boomers about to enter senior-hood and cat food dining The TeaP’s won’t even need Death Panels. In fact many of them will be the first to go, since they shop at WAL*MART’s. Thanks for the comprehensive explanation of what went on there. The story made me terribly sad. Zoe looked like a lovely cat. I’ve had a couple of cats die of age-related problems, unpreventable ones. This was a travesty and totally preventable. Even though it’s far after the fact, I am sorry that you lost him. Unrestrained capitalism is deadly capitalism. There is one thing you have to give China, when companies get caught tainting food, they do take it seriously. Whether anything actually gets done at the corporate level or not is another story, but the head of the company that was involved in the tainted baby formula a few years ago was executed for it. We don’t even punish companies for tainting food, we just allow them to issue a ‘voluntary recall’. As if all these things are just complete accidents and have nothing to do with corporate malfeasance. The sad part is, China has banned some meat imports from the US due to specific feed additives. Should tell you something when they don’t want our meat because its too risky. Diethylene glycol, huh? That seems to be a favorite with unscrupulous manufacturers; its misuse goes back decades (look up the “Elixir Sulfanilamide” incident.) It shares the useful properties of glycerol–it has a high boiling point, high viscosity and a sweet taste–and it’s cheaper than glycerol, which I did not know though I suppose it makes some sense. I see, upon looking into the matter, that the Chinese manufacturers’ confidence in the safety of their product if properly used was so great that they used intermediaries to hide the ultimate origin of the poisonous toothpaste. There should be an import ban on ALL Chinese food and food bi-products. People should pressure their pet suppliers to stop carrying Chinese import pet foods. They should pressure their suppliers to not use Chinese components in the manufacture of america products. PetCo are you listening. – We Americans love our pets and want to give them treats, especially healthy treats. And healthy food. – The Chinese manufacturers have found ways to take very low-quality ingredients and use cheap toxic chemicals to create pet treats and foods to make them seem to have higher quality characteristics — higher protein levels, glucosamine, nutrients and so on. – What testing might be done reveals the desired ‘higher quality’ characteristics, but not the toxic chemical residues that remain behind in the manufacturing process. – Americans buy the treats and food and have no clue we’re poisoning our pets, sometimes fast, more often slowly. The motive throughout all this? Profit. For the past decade, our pets have been the proverbial ‘canary in the coal-mine.’ Now the Chinese want to make food for us. Any bets as to whether it’ll be poisoned and toxic, too? A suggestion for folks who want pet treats: Make them yourself. A simple Google search turns up lots of ways to make your own, some of which simply involves combining ingredients and dehydrating or baking them. That’s what was going on back in 2007. Who knows what’s going on now but you can bet it’s the same sort of thing, cos it’s cheaper to fake good results than to produce good results. Wellness is an example of one of those brands that started off good, when it was run as a family company, but once it became popular it was snatched up by corporate interests and the quality immediately plummeted as they sought to cut every corner possible to make as much profit as possible. Since about 2007 they’ve only been marginally better than average, and been involved in multiple recalls, and even some lawsuits about the quality of their ingredients. Nutro is another brand that has gone through much the same problems. They were great when they were independently owned and operated, but when they were bought up by Mars Inc. their quality plummeted and they started to see recalls and other questionable things with their ingredient sourcing. Thank you for the ‘persnickety’ scientific details. At first, I didn’t think I grasped what’s been going on, but now I think I do. One of the reasons why food manufacturers are so resistant to labeling requirements is because it would take significant effort on their part to track down where every ingredient was sourced. Even if an end-producer of dog kibble sources a raw ingredient from an American company, that other company may be importing from China. Or the guy they get their rendered meat from may be importing from China… four or five steps down the product chain. Some companies even mix imported with domestic ingredients. The world-wide processed food market is truly frightening… and people are confused why people and pets are always getting sick. This. It’s gotten to the point where there is no way, no way at all, to determine what might be a trustworthy brand just by looking at the label. It might say “Purina” on the bag but who knows how many product of unknown companies, companies whose names we’d never recognize even if we were told who they were, went into the fabrication of the final product? Every single ingredient listed on the package might have come from a different, unknown supplier. Heck, pick even a single ingredient and you can’t be sure even that it came from one supplier. Since we don’t have adequate labeling of products in this country, you have absolutely no way of actually knowing where the raw ingredients in your pet’s food (or yours), are coming from. You can be pretty much guaranteed that any supermarket brand of pet food is going to have some ingredient somewhere along the line that is imported. It might even be second or third hand, so the actual end-maker of the pet food doesn’t really know where it’s coming from. That’s how they keep the costs down. Once you start looking at higher grade foods, the price goes up exponentially. But price is most certainly no guarantee of a quality product. Surprise! Among the tainted canine jerky treat brands being recalled is Wellness! This is what happens when a country lacks basic health and safety standards – you know, those pesky “regulations” that hurt the “job creators”. Are you paying attention teabaggers? Check the labels, boycott China! We shouldn’t import anything from China until the so-called capitalists there realize that it isn’t good business to kill off your customers. You get very little repeat business. I saved my dog plenty of grief when I discovered I had two cans of President’s Choice dog food covered by a recall six years ago. I took them back to the store and was given three cans of good dog food in return, but a never bought that brand again. Convincing the Chinese manufacturers may be hard. When one was caught using a poison that was the active ingredient in antifreeze as a glistening agent in toothpaste, the manufacturer sneered that Americans were too stupid to use his product as Chinese people spit it out instead of swallowing it, as if just having it in your mouth wasn’t dangerous. Thanks. I find that, in writing out the story, it hurts as much as it ever did, and I haven’t been able to stop crying for the last few minutes. I’ve thought of, well, cooking for my cats–I have two now, Gibbs (after Josiah Willard Gibbs) and Sarah (after Sarah Jane Smith)–but hitherto it’s been only a speculation. This current episode of adulteration doesn’t apply to my pets, since I don’t feed them treats of the sort that’s under suspicion, but who knows what might happen in the future? Who knows what other cheat might be devised by some food chemist without any sense of integrity or professional ethics? And this is the world the right wing wants us to live in, a world where industry can do whatever it wants unfettered, without regulation, without testing, without any kind of oversight at all from a disinterested authority. It makes me furious, I tell you. Quick now: Which is stupider, buying pet food from China or buying breast milk over the internet? EDIT: This ran rather long. But I hope it suffices to explain why, as a chemist and a lover of pets, any news of chemical adulteration of foodstuffs sends me into a rage. Well…this happened back in 2007 during the melamine scandal. As I think most people know, dry pet foods are very frequently made using high-protein cereal meals, particularly corn gluten meal. Check the ingredient list of the cat kibble you bought at the supermarket and I guarantee that corn gluten meal is one of the chief ingredients. The protein content of the meal is estimated by measuring total content of amine nitrogen–“Kjeldahl nitrogen” it’s sometimes called since the Kjeldahl method of converting amine nitrogen to ammonium and then measuring the quantity of ammonium is simple, straightforward, and can be at least partly automated. Anyway, some bright spark in China figured that you could fool the Kjeldahl nitrogen determination by spiking the sample with a chemical with a very high proportion of nitrogen in it, so you can make a low-quality corn gluten meal that hasn’t got much protein in it look like high-quality high-protein corn gluten meal by adding a dash of an adulterant with a lot of nitrogen. Chinese industry settled on melamine (2,4,6-triamino-sym-triazine) as the adulterant because it’s dirt cheap, already freely available as an industrial chemical–it’s used to make various plastics–and it’s got 67% nitrogen. Moreover, at the time its toxicity was little known and assumed to be low. It seems that very few studies had been conducted into its toxicity (http://jasn.asnjournals.org/content/20/2/245.full). No doubt this encouraged Chinese industry into thinking that they weren’t really going to do much harm with their trickery. Sorry, I realize I’m waffling and taking refuge in pernickety scientific details because…well, it’s easier for me to talk about that stuff, you know. 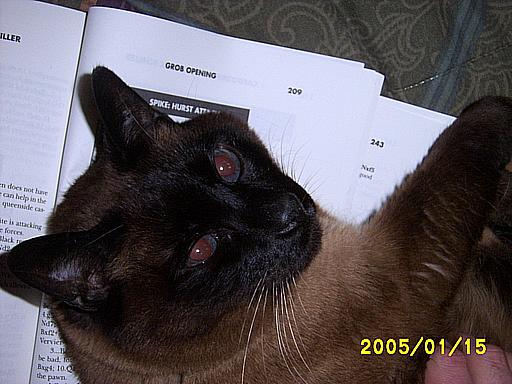 Anyway…the news broke in 2007 that hundreds of pets were dying of kidney failure and at first nobody knew why. I’m not sure what clued the epidemiologists into determining that it was tainted pet food that was the source; in any case, the determination was made and recalls of certain brands of pet food were instituted. If I remember rightly we were buying dry cat food from Costco at the time, under their “Kirkland” brand. None of the lists of suspect brands that were reported in the newspapers mentioned that brand so we thought we were safe…but maybe the damage had already been done. It all began quite slowly. Zoe’s appetite took a downturn and eventually we took him to the vet. They found that he had elevated levels of nitrogen and phosphorus, not too serious, and they prescribed aluminium hydroxide and a couple of other things I don’t remember. The aluminium binds with phosphate, you see, eliminating it as the highly insoluble aluminium phosphate. (Sorry, I’m waffling again, aren’t I.) He seemed to get better for a time and we figured that the problem was under control…but the poor appetite came back, more frequently and more seriously, prompting more visits to the veterinarian. I don’t remember exactly when the turning point was, when we knew that the small problem was really an enormous one…probably his blood urea nitrogen began to head upwards and that’s when the vet knew that Zoe’s kidneys were failing. My condolences. Pets have a way of becoming part of the family. I can avoid the problem for myself by not eating meat, but fur people need meat. Sill, I am tearing up for you. Why the HELL are we importing ANY food products from China (much less anything else). How many times do we have to hear that their food products are tainted to get the hint?? Oh no, I hate to ask what happened, but if you ever feel like sharing your story, I think it might help add to the story, and help inform people. So sorry to hear. I can’t even imagine. Not this crap again! I’ve already lost one beloved animal to poisonous food. At least I’m pretty sure that’s what it was–the timing and the symptoms matched–but there’s no way to be absolutely sure. Christ, I’m tearing up just thinking about it. Anyway…I wonder what brilliant shortcut China’s innovative approach to food chemistry has produced this time. Since it’s chicken and duck jerkies that seem to be the culprit my wild guess is that some genius came up with a clever, chemical process to produce or simulate the effects of dehydration of the meat, avoiding the lengthier, proper method of air-drying.